...the most physically active elderly volunteers, according to their activity tracker data, had better oxygenation and healthier patterns of brain activity than the more sedentary volunteers — especially in parts of the brain, including the hippocampus, that are known to be involved in improved memory and cognition, and in connecting different brain areas to one another. Earlier brain scan experiments by Dr. Burzynska and her colleagues had established that similar brain activity in elderly people is associated with higher scores on cognitive tests. Again, there is the caveat that a correlation does not prove a cause. Maybe not...It is known that people who eat diets rich in fish and antioxidants have better brain health, but this association does not prove cause and effect. Rabin points to a recent massive NIH study of ~3,500 subjects that finds no cognitive effects of dietary supplementation wtih long-chain polyunsaturated fatty acids (LCPUFAs) (1 g) and/or lutein (10 mg)/zeaxanthin (2 mg) (tested vs placebo in a factorial design). All participants were also given varying combinations of vitamins C, E, beta carotene, and zinc. Participants,recruited by retinal specialists in 82 US academic and community medical centers as being at risk for developing late age-related macular degeneration, underwent cognitive tests every two years during the 5-year study. The bottom line: "A total of 89% (3741/4203) of the Age-Related Eye Disease Study 2 participants consented to the ancillary cognitive function study and 93.6% (3501/3741) underwent cognitive function testing. The mean (SD) age of the participants was 72.7 (7.7) years and 57.5% were women. There were no statistically significant differences in change of scores for participants randomized to receive supplements vs those who were not." …computers are rapidly getting better – often far better — than humans are in dozens of areas…analyzing legal cases, providing financial advice, diagnosing illnesses, driving cars and even fighting wars, with battlefield robots and drones. “Affective” computing makes it possible for these machines to understand human emotions and measure levels of stress, often better than we can ourselves. From Oxford Economics, a research firm: skills employers said they would need more of in the next five to 10 years were not so much analytic and technical ones as they were “relationship building, teaming, co-creativity, brainstorming, cultural sensitivity and ability to manage diverse employees – the skills… of “social interaction.”…organizations will build competitive advantage through qualities such as empathy, care, attunement, self-awareness and even generosity….The more valued, appreciated, cared for and taken care of we feel, the more secure and trusting we become, the less preoccupied by fear, and the more likely we are to generate our highest value. …leaders in the workplace must become not just chief executive officers, but also chief energy officers, because their energy – and emotions – are so contagious, for better or for worse. In the present work, we investigate the pop cultural idea that people have a sixth sense, called “gaydar,” to detect who is gay. We propose that “gaydar” is an alternate label for using stereotypes to infer orientation (e.g., inferring that fashionable men are gay). Another account, however, argues that people possess a facial perception process that enables them to identify sexual orientation from facial structure (Rule et al., 2008). We report five experiments testing these accounts. Participants made gay-or-straight judgments about fictional targets that were constructed using experimentally-manipulated stereotypic cues and real gay/straight people’s face cues. These studies revealed that orientation is not visible from the face—purportedly “face- based” gaydar arises from a third-variable confound. People do, however, readily infer orientation from stereotypic attributes (e.g., fashion, career). Furthermore, the folk concept of gaydar serves as a legitimizing myth: Compared to a control group, people stereotyped more when led to believe in gaydar, whereas people stereotyped less when told gaydar is an alternate label for stereotyping. Discussion focuses on the implications of the gaydar myth and why, contrary to some prior claims, stereotyping is highly unlikely to result in accurate judgments about orientation. The blood–brain barrier (BBB) is a large regulatory and exchange interface between the brain and peripheral circulation. We propose that changes of the BBB contribute to many pathophysiological processes in the brain of subjects with chronic sleep restriction (CSR). To achieve CSR that mimics a common pattern of human sleep loss, we quantified a new procedure of sleep disruption in mice by a week of consecutive sleep recording. We then tested the hypothesis that CSR compromises microvascular function. CSR not only diminished endothelial and inducible nitric oxide synthase, endothelin1, and glucose transporter expression in cerebral microvessels of the BBB, but it also decreased 2-deoxy-glucose uptake by the brain. The expression of several tight junction proteins also was decreased, whereas the level of cyclooxygenase-2 increased. This coincided with an increase of paracellular permeability of the BBB to the small tracers sodium fluorescein and biotin. CSR for 6 d was sufficient to impair BBB structure and function, although the increase of paracellular permeability returned to baseline after 24 h of recovery sleep. This merits attention not only in neuroscience research but also in public health policy and clinical practice. Reduced sleep duration is a hallmark of modern-day society and is increasingly associated with medical conditions, such as diabetes, obesity, metabolic syndrome, and cardiovascular disease. Here we present data from a rat model and human clinical study of chronic sleep restriction, both revealing that two metabolites in blood, oxalic acid and diacylglycerol 36:3, are quantitatively depleted under sleep-restricted conditions and restored after recovery sleep. Our findings also reveal a significant overall shift in lipid metabolism, with higher levels of phospholipids in both species and evidence of a systemic oxidative environment. This work provides a potential link between the known pathologies of reduced sleep duration and metabolic dysfunction. Selinger et al. show that the subconscious nervous processes that regulate our movement are constantly adapting to minimize the energy required for movement in a given situation. To show this, they had subjects wear robotic exoskeletons that could increase or decrease resistance to the knees, to change the difficulty of swinging the legs during walking. Within minutes, gate was adjusted to be energetically more optimal. People prefer to move in ways that minimize their energetic cost. For example, people tend to walk at a speed that minimizes energy use per unit distance and, for that speed, they select a step frequency that makes walking less costly. Although aspects of this preference appear to be established over both evolutionary and developmental timescales, it remains unclear whether people can also optimize energetic cost in real time. Here we show that during walking, people readily adapt established motor programs to minimize energy use. To accomplish this, we used robotic exoskeletons to shift people’s energetically optimal step frequency to frequencies higher and lower than normally preferred. In response, we found that subjects adapted their step frequency to converge on the new energetic optima within minutes and in response to relatively small savings in cost (less than 5%). When transiently perturbed from their new optimal gait, subjects relied on an updated prediction to rapidly re-converge within seconds. Our collective findings indicate that energetic cost is not just an outcome of movement, but also plays a central role in continuously shaping it. 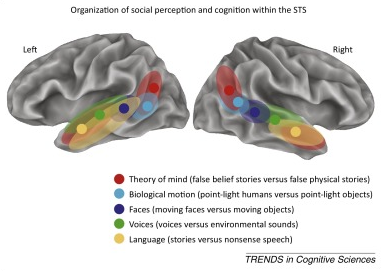 Organization of social perception and cognition within the superior temporal sulcus (STS). Results of Deen et al. are shown on an inflated cortical surface model of the left and right hemisphere. Filled circles show the location of the peak activation, averaged across subjects, for each contrast. Colored regions show the extent of the activation for each contrast (multiple colored regions for some contrasts). A personal posting: On Sunday Sept. 13, Len and I hosted our last musical/social at the 1860 stone school house we have lived in for 25 years (I have been doing affairs like these since 1971-72). The following Wednesday, the Steinway B left for our Fort Lauderdale condo. The school house will be offered for sale in the spring of 2016, as we contract our Madison WI footprint to a condo near the university campus. Good friend Roy Wesley did video recordings of the concert, using a simple camera whose automatic volume control for audio damped out dynamic volume changes. I've posted these on YouTube, commentary and glitches included, just to have a record for myself and a few friends. I thought I would pass on the concert program, some pictures, an embedded video of the final Rachmaninoff pieces, and URLS of the others, to MindBlog readers. J. Brahms Capriccio Op 76. No 2; Waltzes, Op. 39 Nos.1, 12, 13, 14, 15. Recent evidence supports the idea that women use red clothing as a courtship tactic, and results from one study further suggested that women were more likely to wear red on days of high fertility in their menstrual cycles. Subsequent studies provided mixed support for the cycle-phase effect, although all such studies relied on counting methods of cycle-phase estimation and used between-subjects designs. By comparison, in the study reported here, we employed frequent hormone sampling to more accurately assess ovulatory timing and used a within-subjects design. We found that women were more likely to wear red during the fertile window than on other cycle days. Furthermore, within-subjects fluctuations in the ratio of estradiol to progesterone statistically mediated the within-subjects shifts in red-clothing choices. Our results appear to represent the first direct demonstration of specific hormone measurements predicting observable changes in women’s courtship-related behaviors. We also demonstrate the advantages of hormonal determination of ovulatory timing for tests of cycle-phase shifts in psychology or behavior. Heritable risk of developing anxiety correlates with brain metabolism, not structure. A group of Univ. of Wisconsin collaborators adds another installment to their series of articles on anxiety in a primate model for humans. According to the World Health Organization, anxiety and depressive disorders are a leading source of disability, affecting hundreds of millions of people. Children can inherit an extremely anxious temperament, which is a prominent risk factor for the later development of anxiety, depression, and comorbid substance abuse. This study uses high-resolution functional and structural imaging in our well-established developmental nonhuman primate model to identify the heritable neural substrate that underlies extreme childhood anxious temperament. Using a large multigenerational family pedigree, genetic correlation analyses revealed a tripartite neural circuit where metabolism likely shares a genetic substrate with early-life dispositional anxiety. Interestingly, we found that brain function—not structure—is the critical intermediary between genetics and the childhood risk to develop stress-related psychopathology. Understanding the heritability of neural systems linked to psychopathology is not sufficient to implicate them as intergenerational neural mediators. By closely examining how individual differences in neural phenotypes and psychopathology cosegregate as they fall through the family tree, we can identify the brain systems that underlie the parent-to-child transmission of psychopathology. Although research has identified genes and neural circuits that contribute to the risk of developing anxiety and depression, the specific neural systems that mediate the inborn risk for these debilitating disorders remain unknown. In a sample of 592 young rhesus monkeys that are part of an extended multigenerational pedigree, we demonstrate that metabolism within a tripartite prefrontal-limbic-midbrain circuit mediates some of the inborn risk for developing anxiety and depression. Importantly, although brain volume is highly heritable early in life, it is brain metabolism—not brain structure—that is the critical intermediary between genetics and the childhood risk to develop stress-related psychopathology. Brain correlates of learning character traits versus rewards. Hsu and Jenkins summarize work of Hackel et al. showing where our brains learn about traits versus rewards. In a functional magnetic resonance imaging (fMRI) study..., Hackel et al use an innovative combination of ideas and tools from social psychology, economics and cognitive neuroscience, they offer neural evidence that associative learning processes are involved in making inferences about traits. Specifically, the authors conducted a study in which participants interacted repeatedly with eight different partners: four purported human participants and four slot machines. On each trial, participants chose to interact with one of two human (or slot machine) counterparts. The chosen counterpart, who had been endowed with a certain number of points on that trial, then shared some proportion of those points with the participant. Critically, targets varied orthogonally in terms of the average magnitude of their starting endowment (reward) and the average proportion of the endowment that was shared with the participant (generosity), enabling the authors to dissociate signals associated with trait learning from those associated with reward processing. Consistent with the idea that trait learning engages associative learning processes, BOLD (blood oxygen level-dependent) responses of the ventral striatum during an initial training phase were predicted by an associative learning model that captures both reward and trait information. Moreover, two pieces of evidence support the idea that participants were able to make use of this trait information in a manner described by psychological theories of trait attribution. First, in a test phase in which participants knew each potential partner's starting endowment, participants chose interaction partners on the basis of those partners' past levels of generosity, and the extent to which they did so was associated with activity in the ventromedial prefrontal cortex (see figure). In addition, participants exhibited a tendency to generalize these generosity attributions, preferring the more generous targets when asked to pick a collaborator for a new, cooperative task-a hallmark of trait attribution. Figure: Learning about traits versus rewards. In an fMRI study, participants interacted with partners who varied in reward (the absolute amount of money shared with the participant) and generosity (the proportion shared). 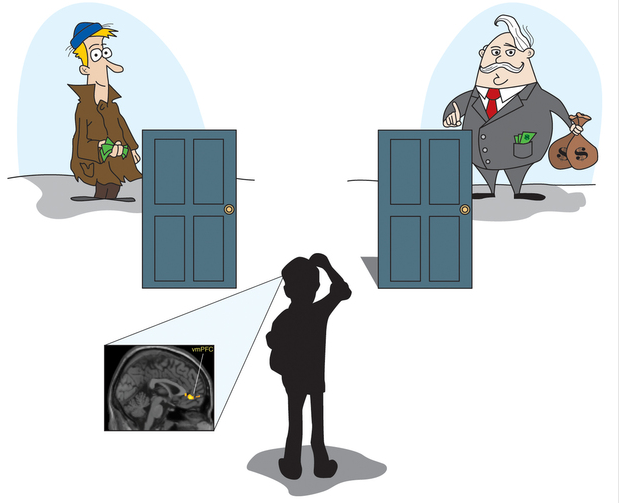 Activity in the ventromedial prefrontal cortex (vmPFC) was associated with preferring more generous targets, even when those targets shared less money in absolute terms. Speer et al. observe responses in the corticostriatal circuits that respond to monetary reward when positive autobiographical memories are recalled. These response "may be adaptive for regulating positive emotion and promoting better well-being." Reminders of happy memories can bring back pleasant feelings tied to the original experience, suggesting an intrinsic value in reminiscing about the positive past. However, the neural circuitry underlying the rewarding aspects of autobiographical memory is poorly understood. Using fMRI, we observed enhanced activity during the recall of positive relative to neutral autobiographical memories in corticostriatal circuits that also responded to monetary reward. Enhanced activity in the striatum and medial prefrontal cortex was associated with increases in positive emotion during recall, and striatal engagement further correlated with individual measures of resiliency. Striatal response to the recall of positive memories was greater in individuals whose mood improved after the task. Notably, participants were willing to sacrifice a more tangible reward, money, in order to reminisce about positive past experiences. Our findings suggest that recalling positive autobiographical memories is intrinsically valuable, which may be adaptive for regulating positive emotion and promoting better well-being. A classification of cognitive mechanisms in meditation practice. Scientific research highlights the central role of specific psychological processes, in particular those related to the self, in various forms of human suffering and flourishing. This view is shared by Buddhism and other contemplative and humanistic traditions, which have developed meditation practices to regulate these processes. Building on a previous paper in this journal, we propose a novel classification system that categorizes specific styles of meditation into attentional, constructive, and deconstructive families based on their primary cognitive mechanisms. According to this model, the primary cognitive mechanisms in these three families are: (i) attention regulation and meta-awareness; (ii) perspective taking and reappraisal; and (iii) self-inquiry, respectively. To illustrate the role of these processes in different forms of meditation, we discuss how experiential fusion, maladaptive self-schema, and cognitive reification are differentially targeted by these processes in the context of Buddhist meditation, integrating the perspectives of other contemplative, philosophical, and clinical perspectives when relevant. The mechanisms and targets we propose are drawn from cognitive science and clinical psychology. Although these psychological processes are theoretically complex, as are the meditation practices that target them, we propose this novel framework as a first step in identifying specific cognitive mechanisms to aid in the scientific study of different families of meditation and the impact of these practices on well-being. One of the most widely studied practices in the constructive family is the cultivation of compassion. Compassion training is held to alter core self-related processes, initiating a shift from self-oriented cognitive, affective, and behavioral patterns to patterns that are oriented toward the well-being of others...Research into the neural correlates of empathy has found that similar regions, including the insula, the anterior and mid-cingulate cortices, and the supplementary motor area, are activated across various forms of empathy...By way of contrast, compassion is linked to regions associated with reward, positive affect, and feelings of affection, such as the ventral striatum and medial orbitofrontal cortex...Studies of compassion training have also found increased activation in regions associated with executive function, including the dorsolateral prefrontal cortex and the anterior cingulate cortex...these preliminary findings suggest that cultivating compassion strengthens multiple networks, each of which may affect distinct psychological processes and thereby contribute to well-being in different ways. Empathy and compassion also affect the peripheral biology of the human body. Perceiving stress in another individual has been linked to elevated cortisol levels, a relation that is more robust in those with high trait empathy, whereas compassion has been linked to lower levels of cortisol reactivity. Preliminary studies of compassion training have found associations between the amount of time spent engaging in compassion training and inflammatory biomarkers, with more compassion training leading to decreased levels of both C-reactive protein and interleukin 6. These findings suggest that the mind can be trained to orient itself toward the well-being of others and that this shift from self- to other-orientation impacts both the brain and the peripheral biology of the body and, in particular, the way the body responds to environmental stressors. Further research is required to elucidate the precise mechanisms through which these states affect the body, and also to investigate how changes in peripheral biology reciprocally impact psychological processes and the relationship between these processes and well-being. Helen Shen offers a review of studies on oxytocin, the “hug hormone,” which influences maternal behavior and social attachment in various species. She notes research showing that oxytocin acts on inhibitory interneurons in a way that quiets background chatter within neuronal circuits, and thus may help social interaction and recognition is by enhancing the brain's response to socially relevant sights, sounds or other stimuli. MindBlog has done posts on experiments showing that oxytocin, delivered through an intranasal spray, can promote various aspects of social behavior in healthy adults. People who inhale oxytocin before playing an investment game are more willing to entrust their money to a stranger than are placebo-treated players. A dose of the hormone increases the amount of time people spend gazing at the eye region of faces, and improves their ability to infer the emotional state of others from subtle expressions. Shen’s review also summarizes efforts to test oxytocin’s usefulness in treating psychiatric disorders such as autism. Lizzie Wade offers two interesting summaries of work on the evolution of religion that suggest that as societies grew bigger, so did their gods. She describes the efforts of Anders Petersen, who is asking religious studies scholars to contribute his "Database of Religious History" project by answering a series of questions about the ancient religions in which each of them specialize. This kind of survey can help in testing a “big gods” hypothesis: "Did moralizing gods, community-wide rituals, and supernatural punishment emerge before or after societies became politically complex? Has any large-scale society succeeded without prosocial religion? And what does “moralizing” really mean in different cultures and at different times?" Wade's second article describes work of Ara Norenzayan and others suggesting that judgemental deities were the key to obtaining the cooperation needed to build and sustain large and complex ancient societies..."once big gods and big societies existed, the moralizing gods helped religions as dissimilar as Islam and Mormonism spread by making groups of the faithful more cooperative, and therefore more successful." Young children learn language from the speech they hear. Previous work suggests that greater statistical diversity of words and of linguistic contexts is associated with better language outcomes. One potential source of lexical diversity is the text of picture books that caregivers read aloud to children. Many parents begin reading to their children shortly after birth, so this is potentially an important source of linguistic input for many children. We constructed a corpus of 100 children’s picture books and compared word type and token counts in that sample and a matched sample of child-directed speech. Overall, the picture books contained more unique word types than the child-directed speech. Further, individual picture books generally contained more unique word types than length-matched, child-directed conversations. The text of picture books may be an important source of vocabulary for young children, and these findings suggest a mechanism that underlies the language benefits associated with reading to children. And, Hutton et al. note that children with greater home reading exposure exhibit higher activation of left-sided brain regions involved with semantic processing (extraction of meaning).